Shipping: U.S. Ground Shipping included(Contiguous US Only). This bundle includes either eCAL lite or eCAL (full version) software (SCAL for Sizzix eclips) and a Sizzix eclips2 Electronic Shape-Cutting Machine. 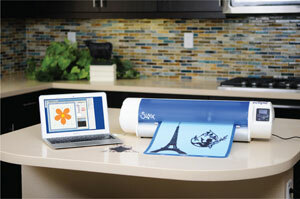 "eCAL" is an easy to use software which allows you to cut virtuallly any shape with your Sizzix eclips cutter. We have teamed up with Sizzix to bring you this exclusive version of our popular Sure Cuts a Lot software for the Sizzix eclips machine. In this case, the sequel is even better than the original. With no cartridges required, the newly redesigned eclips2 DIY Electronic Cutter contains an enhanced motor with industrial-strength gears for speed, reduced noise, effeciency, precision cutting and more. In addition, the eclips2 is accompanied by eCAL lite software to create your own designs, plus cut, score and draw/edit unique shapes for beautiful customized projects from the start. Hundreds of shapes included, with thousands more available online. Built to last - Completely reworked machine twith industrial-grade components.